Manchester United and Chelsea have been linked with Cagliari midfielder Nicolo Barella and the latest reports going on in the media are very interesting. The Blues are looking to sign the Italian international to replace Cesc Fabregas at Stamford Birdge, however Starsport (The Daily Star) understands that Manchester United are firm favorites to ‘clinch’ £50million signing of the midfielder. 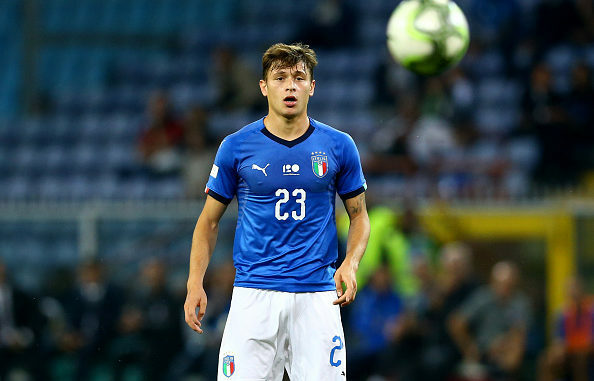 Barella made his senior international debut last year and so far, he has played four times for the Italians. He can play in the central and attacking midfield roles. In the current campaign, the 21-year-old Azzurri starlet has so far featured in 20 league games, scored 1 goal and provided 1 assist. Last season, he did not even provide a single assist for Cagliari, still, he is very highly rated. Only those who have watched Barella play would know the quality the player possesses. He is a hard worker in the center of the park, who helps his side with driving runs and provides quality balls to dominate the midfield battle. Unfortunately, his team-mates are not good enough and he needs to move away from the club. Modric only provided one assist in the Champions League last season and one assist in the 2018 World Cup but he won the Golden Ball and the Ballon d’Or. Wijnaldum has only scored once and provided no assist for Liverpool this season but the Dutch star has been a vital member of the Reds’ team and he has made more appearances than any other midfielder in Klopp’s squad this season. Therefore, stats do not define a player’s true value. Barella is top quality and that is why the Red Devils have identified him as a rising star for the future (The Daily Star).